Since the weather was so nice in the desert area just north of Phoenix AZ 7 of us decided to go for a nice long ride for the day. 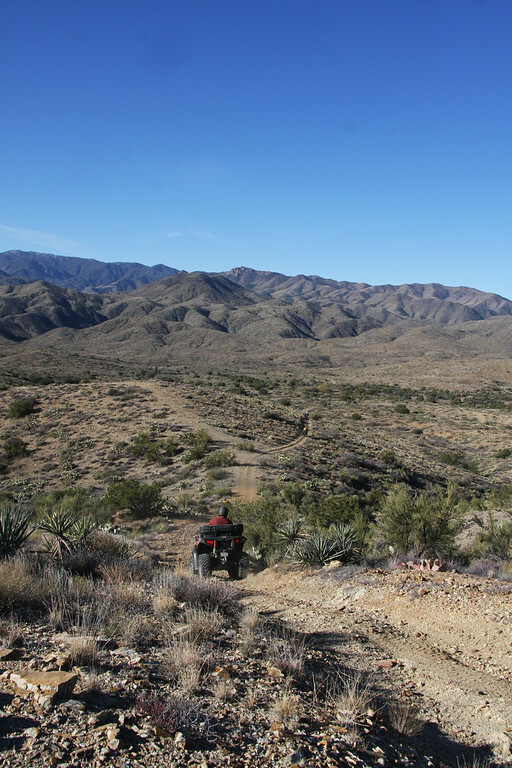 Our plan is to start in the desert North of Black Canyon City which has an elevation of about 2,000 feet. We will combine a few trails along the way. 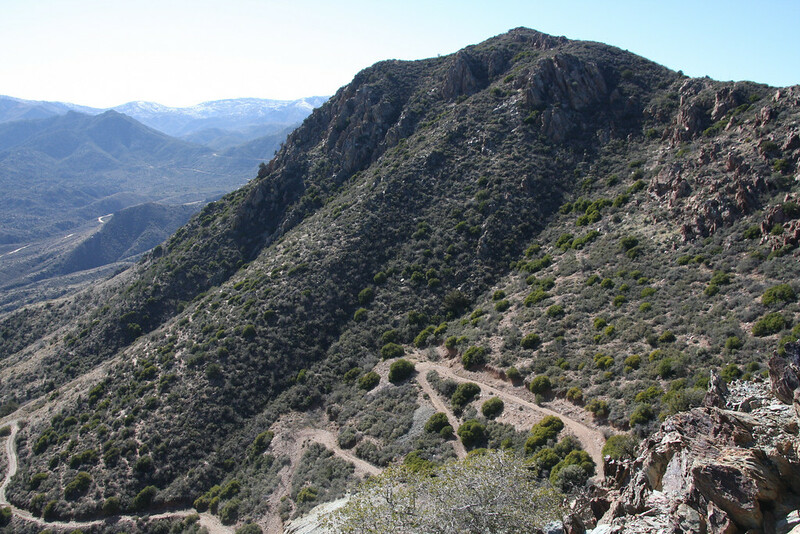 At mid day we will stop at Crown King an old mining town near the tops of the Bradshaw Mountains at an elevation of approx. 6,000 for lunch. Then return via what I call the back way from Cleator along Turkey Creek to our trucks by late afternoon. We all met at the staging area as usual to unload and get ready for the ride as the sun was coming up. I was the 4th truck back from the front of the group. I just unloaded my quad when I heard a bunch of noise at the head of the line. 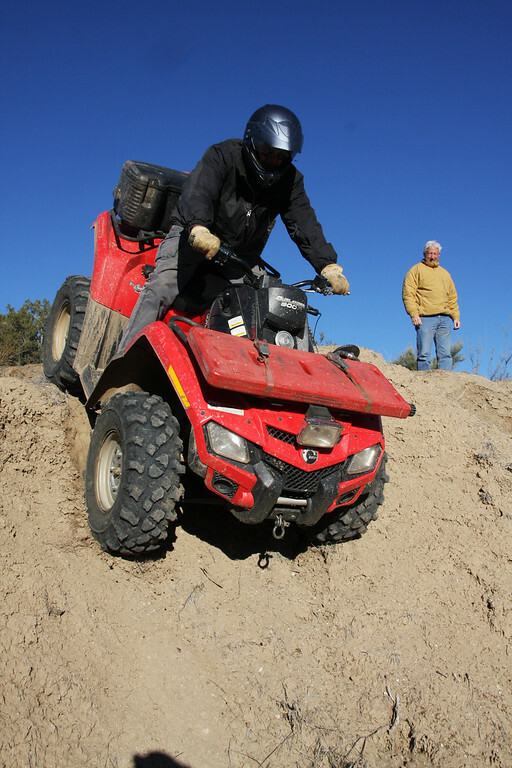 I looked up and saw Jeff’s King quad on its lid, wheels up and Jeff underneath the machine. I threw my keys and went running. By the time I got there Zane and Bob had the quad off of him but he got his bell rung pretty good. He has a cut on his eye lid and a few scrapes as well. All and all I would say he was lucky. He didn’t put on his helmet to unload and didn’t start his machine. He was going to just idle down the ramp. We think he hit his rear break as he reached the bottom of his steep ramps and the quad immediately flipped over on top of him. He never even had a chance to jump off. Well that was the end of Jeff’s riding for the day. We have lost riders before but never in the parking lot unloading. I guess this is a good teachable moment. Jeff called us later in the day to let us know he got 3 stitches in his eyelid and a thorough check up. The back of his head was sore along with his ribs. It could have been much worse. Jeff had the GPS tracks for this ride but now I had to lead. I have the GPS tracks in my head. Some of the guys make fun of me because I don’t use a GPS. I have one . I just normally don’t turn it on. Maybe someday. Oh well I know the planned route. 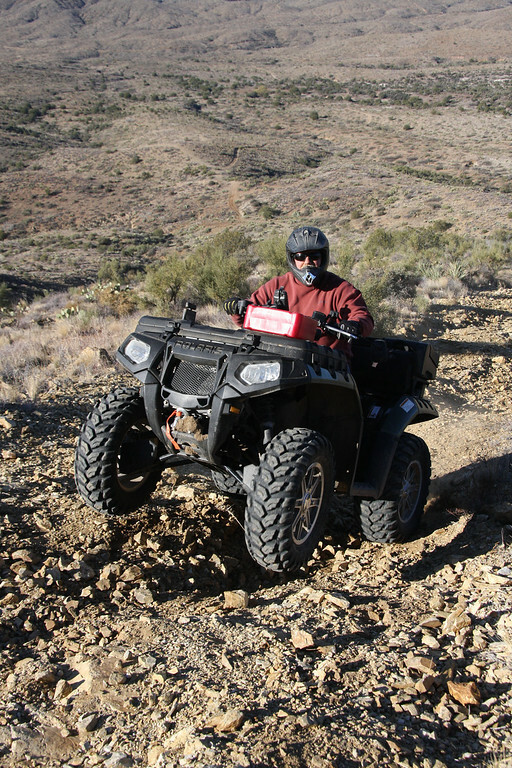 Of the riders we have left we have two quads with Maxxis Bighorns, one with Maxxis Cerros, one with PitBull Rockers and me with DWT Moapa tires along with a motorcycle. It will be fun to see if we will be able to tell the difference in grip from one tire to the next. 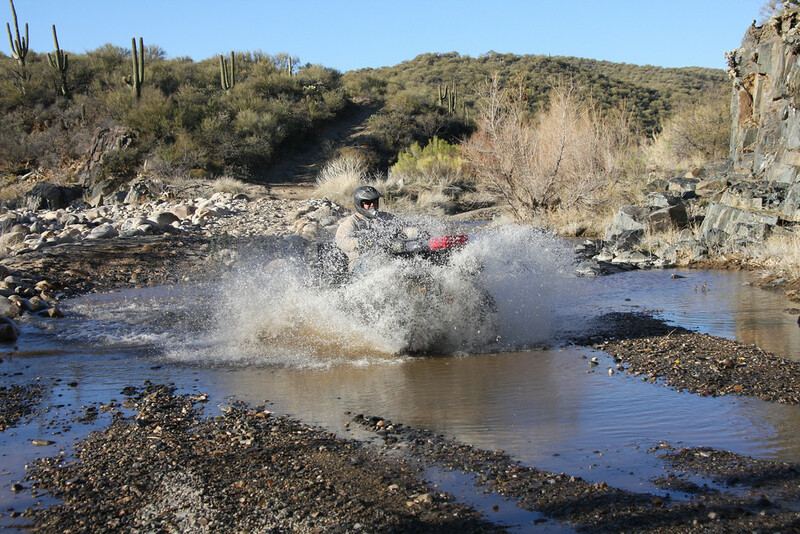 Instead of taking the main dirt road to Cleator we took a detour down along the wash to get warmed up. Some of the guys thought it would be fun to air out their quads a bit on a small jump. Zane decided to see how his rockers with over 4,000 miles on them would hold on an almost straight drop off into the wash with Bob, our Bill Clint look alike looking on. Our next obstacle was a very steep, loose, long, rocky hill climb. There were a couple of ledges towards the top of the climb that would get your full attention. This climb was not part of the destination but it was very close to the start of the drop off trail and it is a nasty climb so we just needed to do it because it was there. What a blast. 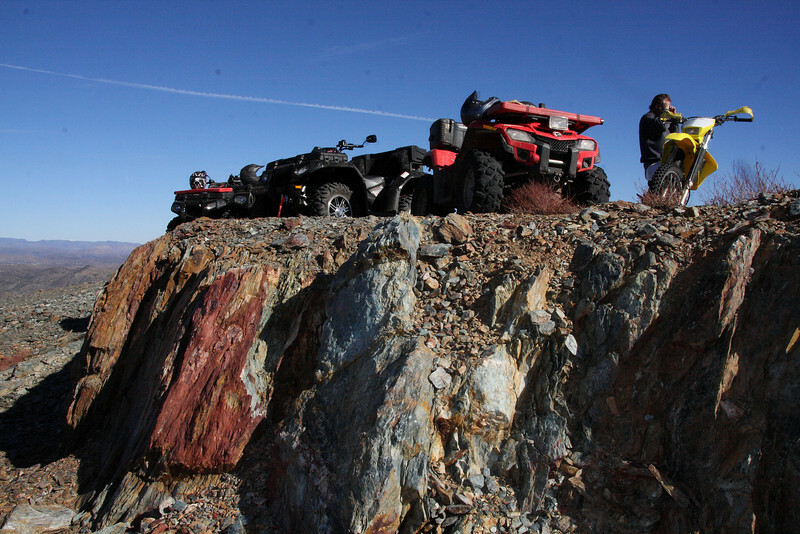 You can really feel your tires searching for grip as you claw you way up the loose rocky hill. 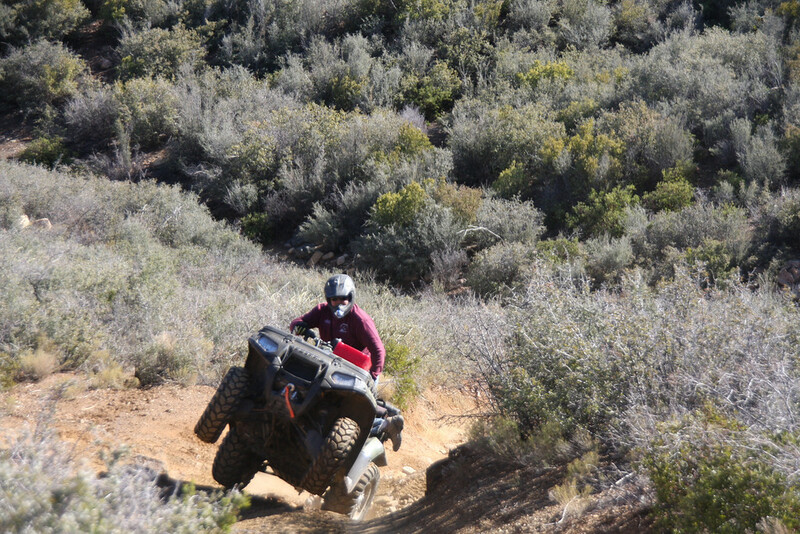 It is amazing the tires are able to get traction in some places because it is so loose and steep but nobody had any problems. What a beautiful day to be out riding as I take the group to a trail I named The Drop Off Trail. I found this a couple of years ago from the other side of a canyon. Jeff and I scouted it out but the trail is washed out near the bottom. 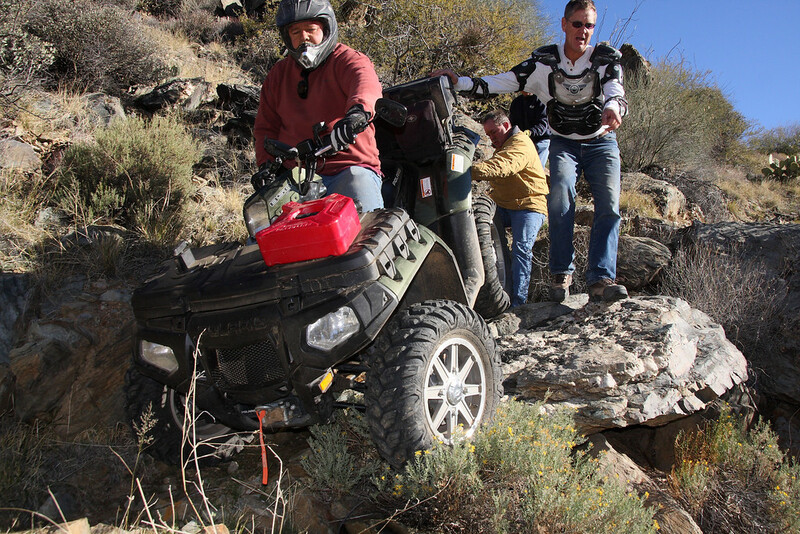 No worries we can just put a rope on the back of the quad to keep it safe for the rider as he rides down the rock ledge. Bob was eager to go first as we had to drop off the side of hill towards the bottom because the trail has bee3n washed out what appears to be many years ago. I stopped Bob until we had a rope secured on the back of his quad. I said I know it doesn’t look steep but it is quite off camber along with being steep. Bob whole heartily agreed as he started down the trail. We make our way down one at a time except for Jim on his motorcycle. He went down ahead of everyone and just jumped off the ledge. Show off!! Zane was last and when he started down Jim said “ we’ll see you later Zane” . He said, wait a minute. Jim’s reply was , “if you need help, we shouldn’t be here”. Ha, ha. That was a good one. It just so happens that Zane is one of the most talented riders of the group. Wow, that was a blast. We were not the least bit cold anymore. At the bottom of the wash there was a truck that rolled off the trail on the side we were about to go up. What a shame. It looked like it used to be a nice truck. Since we were going to do the Desoto mine trail we might as well show a couple of the guys the top of the mountain while we are going by. This is the top of the Desoto Mine. As you look over the edge you can see the switchback road that the miners took to work the mine back in the old days. As we come back down from the top we continue along the Desoto Mine trail. 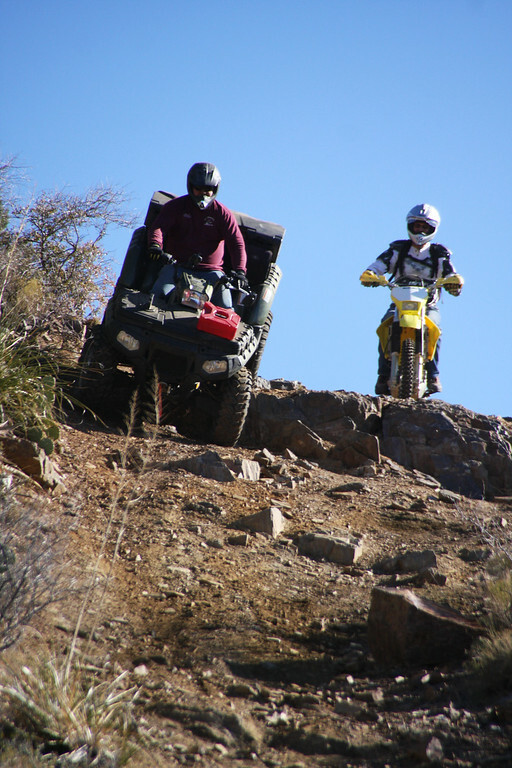 This is a well known Jeep trail we have been doing for a number of years. 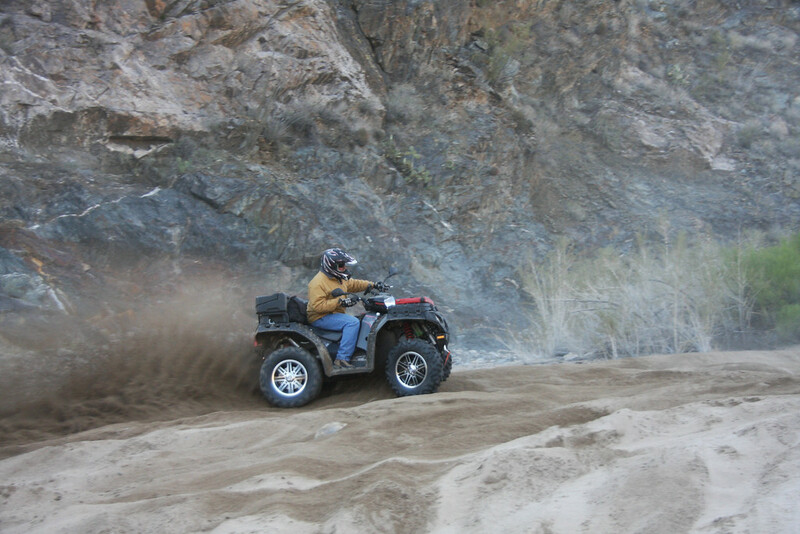 It is even listed in the Gordon Wells book Off-road of Arizona. There are a few places that can give you quite a pucker along the way. Bob found out how quickly the trail can turn on you as he was too close to Terren on a steep hill climb and got caught on a step up. 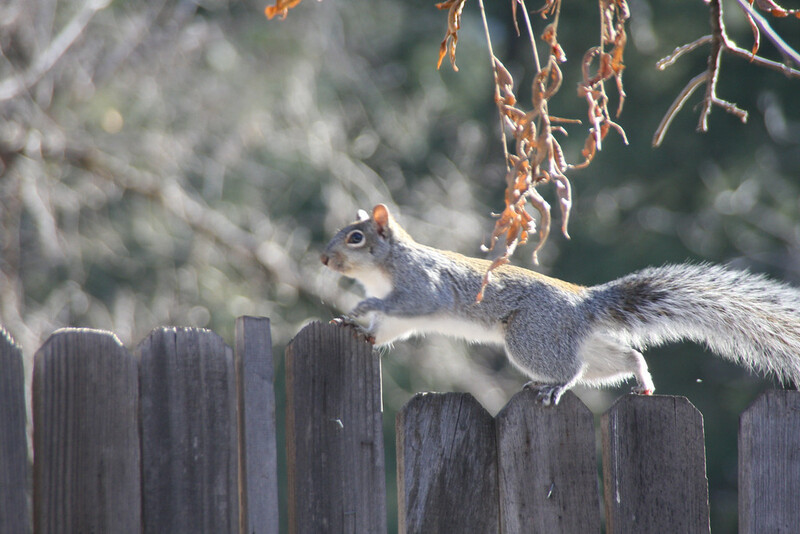 I wasn’t sure what to do as I was a long way up the hill with my 250 MM lens as he was teetering. I yelled at him to see if he needed help but he powered through the spot on his Polaris XP 850 with the grip of the Maxxis Cerros tires. I will say he had me nervous but he pulled through like a champ. Luckily Bob is an excellent rider. 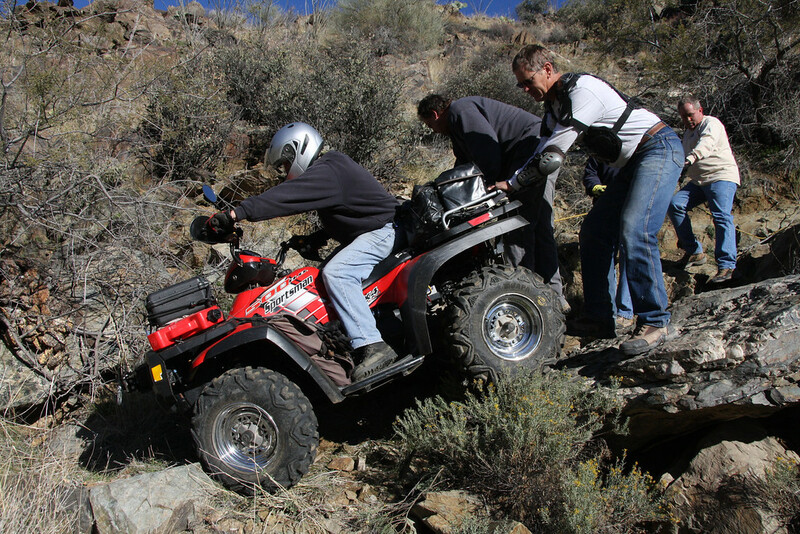 There are plenty of obstacles along this trail but with this group we did not make hardly any stops to get photos as we powered through the rugged terrain. 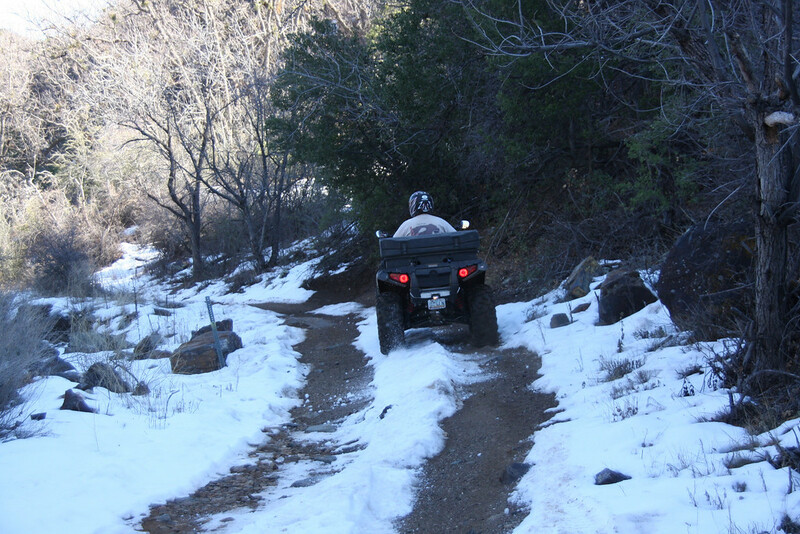 Along our way to the old gold mining town of Crown King we ran into some snow. This is a good indication that we are climbing in elevation. We came out to the main dirt road for the last 10 miles to Crown King. Four of the group took off behind a pick- up truck. I told Terren to follow me, I know a short cut. There is a trail at the beginning of the first switchback that goes almost straight up the side of the mountain rather than having to go the long way around. As we started up the trail I forgot this had some good off camber boulder crawls. 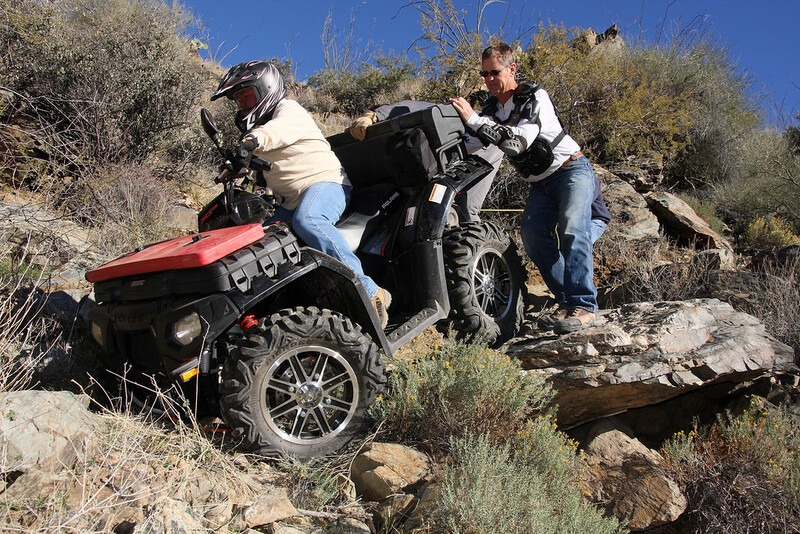 Fortunately my Moapa’s and Terrens Bighorns have excellent sidewall grip so we were able to fly up the trail. We came out ahead of the truck on the next switchback. Of course we made to the town before the rest of the group. I was kind of funny as they could not understand how we made it there before them. What a blast. The first gold mines were recorded in Crown King in 1875. All the mines in the area have been closed since the 1950’s. 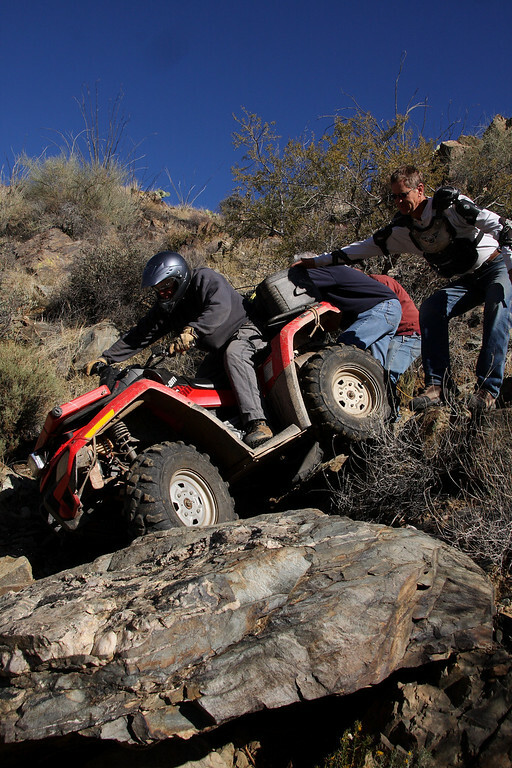 This is one of the reasons there are so many trails all over the Bradshaw Mountains. They were built as mining roads. There are estimates that over $2,000,000 in gold was taken from the Crown king mine alone. We had time for an excellent burger sitting in the pine trees at the old Saloon before heading back down the mountain. This little guy was hoping we would share our meal but he was out of luck. There was one place along the creek that had a ton of loose sand. Terren thought it would be funny to roost me as I was taking some photos. That was not good as it went down my back. On our last run to the main road Terren pulled over. I was last and stopped with him. We found a hole in his brand new Bighorn tires right in the middle of the tread. Very strange but it happens. This was his first ride with his new horns. Oh well He threw in a couple of plugs and was good to go. As we reflected on the ride and how each of the tires handled the terrain it was difficult to find any fault with any of the different kind of tires. They all gave us excellent traction throughout all kinds of difficult rocky rutted terrain. We did not do any specific testing on this ride but we did pay attention to grip on obstacles. We are so lucky to be able to ride in an area where we can start at a low desert elevation, eat lunch in the pines and ride back to the warmth of the desert all in one day. We made it back to the truck safe and sound 85 miles later with no other incidents other than Jeff unloading his quad. 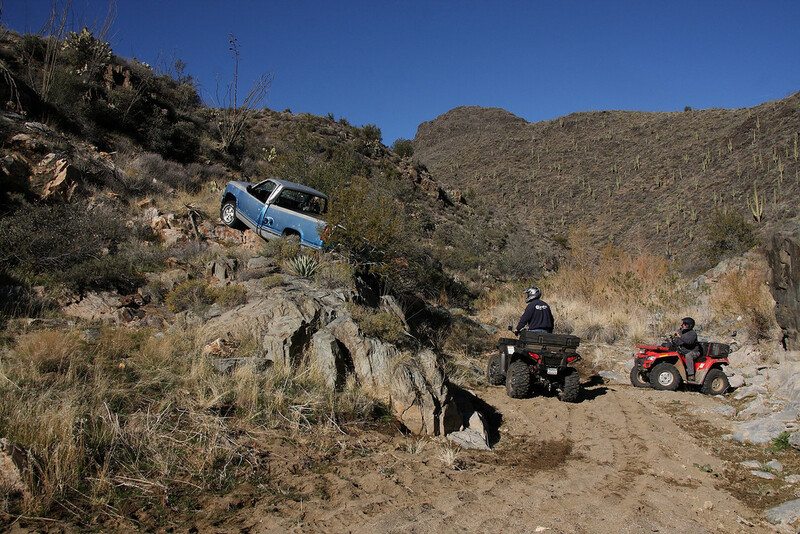 The funny thing is Jeff was telling everybody there was a spot on the trail we would have to use ropes We just didn’t know it would be for him when he was unloading his quad out of his truck. We learned another lesson today. 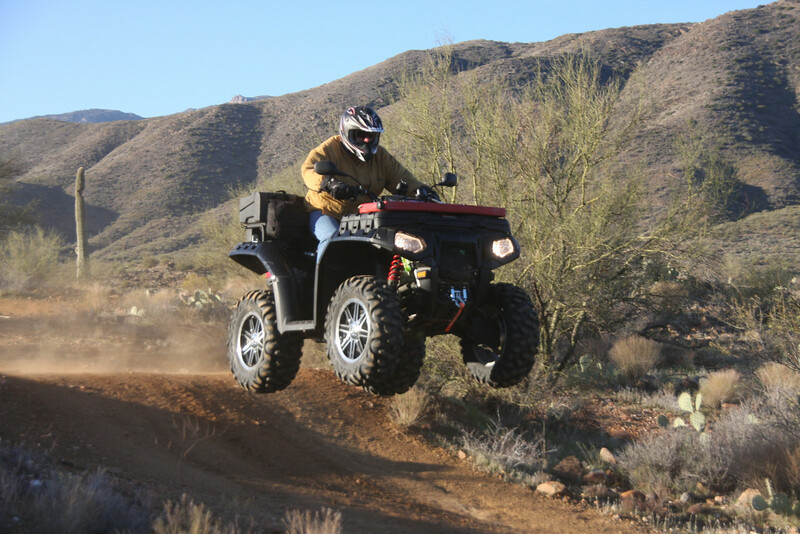 Don’t take unloading your quad from the truck for granted, and always buy your tires and wheels from Discount Tire Direct. 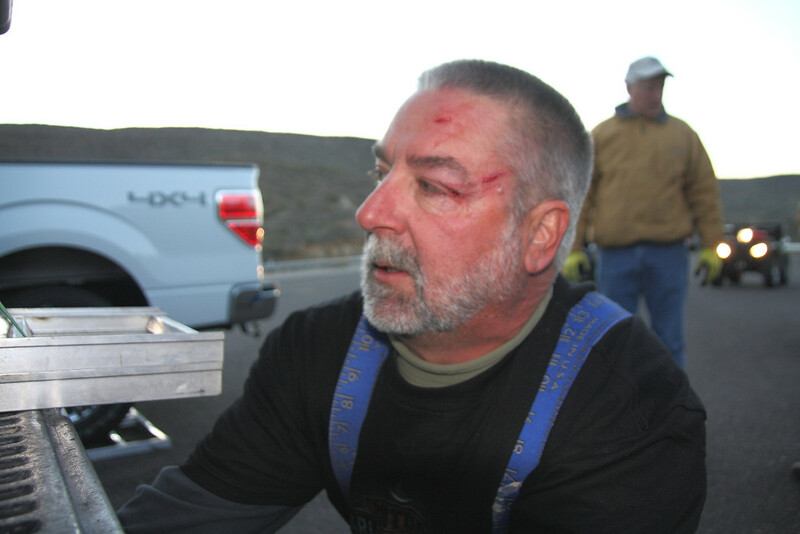 May 27, 2010 -- Grand Canyon North Rim, the hard way.